"Your one-stop plastic mesh bag supplier"
Suppliers of Poly Tubular Net Rolls, Converted Bags and Nylon loops. Conversion of all PVDC, Nylon and Fibrous casings. 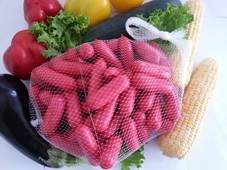 You can get plastic mesh bags and all types of casings for the meat ,poultry, horticulture small goods and aqua-culture industries custom made to your specifications at Betta-Net Products in Auckland. We convert poly tubular net rolls into polypropylene mesh bags for preparing meat or polyethylene mesh bags for packaging, horticultural produce, aqua-culture products and small goods. You can get these plastic mesh net bags in a wide range of sizes, weights and colours. 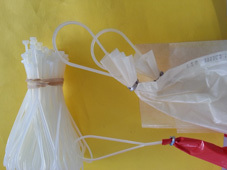 The mesh bags can be heat-sealed or closed with a metal clip, depending on your preference or how you plan to use them. 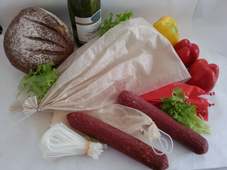 We also do conversion of fibrous casings for salami, sausages and other processed meats. Contact Betta-Net today to get the perfect plastic mesh bag for your purpose.